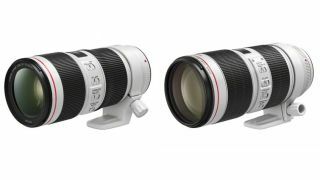 Confirming rumours that first surfaced a few months ago, Canon has updated two of its most popular telephoto zoom lenses. The EF 70-200mm f/4L IS II USM and EF 70-200mm f/2.8L IS III USM update the EF 70-200mm f/4L IS USM and EF 70-200mm f/2.8L IS II USM that were announced in 2006 and 2010 respectively. The new arrivals join the EF 70-200mm f/2.8L USM and EF 70-200mm f/2.8L USM in Canon's line-up, which brings the total number of 70-200mm options to four. The more affordable lens of the two, the EF 70-200mm f/4L IS II USM features flourite elements to help combat chromatic aberrations, along with Super Spectra coatings on the inside to eliminate ghosting and flare. A further fluorine coating, designed to repel dirt, water and grease, is found on its front element. Weighing 780g, the lens incorporates nine diaphragm blades for rounded bokeh and a new Image Stabilizer system, one that's said to be based on the design of the one inside the EF 100-400mm f/4.5-5.6L IS II USM. In contrast with the three-stop advantage of the IS system found inside the lens's predecessor, this unit is said to deliver a five-stop benefit. Focusing is handled by a ring-type USM motor, which works with a third-generation EF engine. This makes use of a high-performance control CPU and new firmware to keep focusing fast and accurate. One further advantage over its predecessor is that minimum focusing distance has decreased from the previous 1.2m limit to just 1m here. The Canon EF 70-200mm f/2.8L IS III USM also boasts similar advantages to the EF 70-200mm f/4L IS II USM, such as its constant maximum aperture, fluorine coatings (on both rear and front elements) and fluorite optics, although the most obvious difference is that its aperture is one stop wider at f/2.8, which makes it more suitable for the pro market at which its aimed. Another advantage is weather-resistance, which comes courtesy of various seals around the barrel. The 23-element, 19-group lens doesn't mirror its launch partner in offering nine diaphragm blades, settling for the eight of its predecessor instead. Perhaps more interestingly, while it also claims to have a new Image Stabilizer unit on board, Canon only offers a 3.5-stop advantage, which is a half-stop reduction on the four stops promised by the Mark II version. The EF 70-200mm f/4L IS II USM is set to retail at £1,299.99/$1,299, while the EF 70-200mm f/2.8L IS III USM will be available at £2,149.99/$2,099. We'll update this page with Australian pricing as it becomes available. Both lenses are set to be available this summer.